If you make a list of the most noteworthy, technically innovative, and memorable cars of the 20th Century, many of them have one thing in common: the twin-chevron emblem of Automobiles Citroën SA. Founded by an inveterate gambler, Citroën developed a reputation for bold engineering that beggared almost every other automaker in the world, building cars that were decades ahead of their time. Let’s look at the first great Citroën, the car known in France as “La Reine de la Route” (queen of the road): the 1934-1957 Citroen Traction Avant. André Citroën was born in Paris on February 5, 1878, the youngest son of a Dutch diamond merchant and his Polish wife. After studying at the prestigious École Polytechnique, Citroën went into the French army as an engineering officer. He left the service in 1904, acquired the patent rights to a “herringbone” double-helical gear, and went into business manufacturing gears for industrial equipment. Although Citroën’s gear-making business was quite successful, he was lured away in 1908 by an offer to become the new chief engineer for automakers Emile and Louis Mors. Although at that time Citroën was not particularly interested in automobiles, he was one of France’s leading experts in industrial production, so he wasted little time in thoroughly revamping the Mors operation and greatly increasing its output. He returned to his own business in 1913 and took the company public as Le Société des Engrenages A. Citroën. Citroën’s thinking on mass production was greatly shaped by the American industrialist Henry Ford, whom Citroën idolized and whom he had met on a visit to Michigan in 1912. (Citroën, who was Jewish, was apparently either oblivious to or undeterred by Ford’s notorious antisemitism.) Inspired by Ford’s U.S. factory complex, Citroën established a huge modern factory on the Quai de Javel in Paris, which became one of France’s largest munitions producers of World War I. Even before the 1918 armistice, Citroën began thinking of new postwar applications for the enormous factory. In May 1919, he reorganized his company as Automobiles Citroën SA and soon began manufacturing an automobile under his own name: the Citroën Model A, designed by Jules Salomon, who had served with Citroën in the army. The Type A was a simple, robust little car, capable of a reasonable 40 mph (64 km/h). It was a solid commercial success, as were its successors, the Type B and Type C. They were sound, generally unremarkable designs, but they became very successful through Citroën’s tireless and inventive merchandising acumen. He was adept at concocting dramatic stunts to promote his wares, including paying to put the Citroën name in lights on the side of the Eiffel Tower. Such aggressive marketing was matched with bargain pricing, which translated into strong sales. Unlike Henry Ford or Walter P. Chrysler, Citroën was not an automotive engineer; he entrusted the design of his cars to his staff. Like Ford, he was fascinated with the mechanics of mass production — how to make things faster, cheaper, and more efficiently — but unlike Ford, he had little intrinsic fascination with the cars themselves and was not an enthusiastic driver. That he chose automobiles as the focus of his postwar business was mostly because he saw a ready market, particularly for inexpensive people’s cars in the mode of Ford’s Model T. The early Citroëns were certainly not as crude as the Model T, but they were born of a similar mindset. So, how did a maker of unpretentious, proletarian transportation end up producing one of his era’s most innovative cars? Paradoxically, Citroën’s principal objective for the Traction Avant was production economy. Like Henry Ford, Citroën recognized that developing new models (and establishing the tooling to build them, which is frightfully expensive) costs considerably more than continually refining an existing product. However, Citroën was also a savvy enough salesman to realize that any given product has a finite lifespan beyond which the model becomes too conceptually outdated to be commercially viable. The obvious solution, he concluded, was to develop a car that would be so blindingly advanced that it would take years or decades for rivals to even catch up, much less surpass it. In that way, its useful production life would be maximized, the cost of producing it could be progressively reduced, and Citroën stood to make a greater total return on his initial investment. With an overall height of 59.5 inches (1.5 meters), the Citroën Traction Avant was one of the lowest cars in the world when first introduced. It’s more than 8 inches (20 cm) lower than the early-thirties Fords that it otherwise resembles and no taller than a Chevrolet of twenty years later. Despite that, the Traction is quite roomy; the unitary construction means that there are no conventional frame rails, allowing the floor to be placed lower without sacrificing headroom. Note the lack of running boards, very unusual at the time; their deletion allowed the body to be widened for more interior room. This philosophy was something else Citroën shared with (and perhaps had learned from) Henry Ford. In fact, Ford had pursued a very similar line of thinking when envisioning a replacement for the venerable Model T, which he hoped to follow with a highly advanced new model powered by an unusual X-8 engine. However, even Ford was eventually persuaded that those plans were unworkable and grudgingly accepted the more conventional Model A instead. Citroën was not so easily dissuaded. Since he remained relatively ignorant of the particulars of automotive engineering, Citroën was more insulated from conventional wisdom or the practical considerations of why a particular idea would or wouldn’t work. Moreover, he was a lifelong gambler, with a gambler’s superstitious faith in his own instincts and an unflagging (if sometimes reckless) willingness to lay all his money on a single number if he thought it would pay off. In 1932, Citroën embarked on what would be his last and greatest gamble: the development of the all-new model that he hoped would become Citroën’s perennial car. The performance targets Citroën set were modest even by the standards of the time: a top speed of 62 mph (100 km/h) and fuel economy of 33.6 mpg (7 liters/100 km). However, the specifications he envisioned were of an entirely different order. At a time when most cars, even expensive ones, had composite wood-and-steel bodies on separate frames and conventional front-engine/rear-drive powertrains, he wanted unitized construction, front-wheel drive, and automatic transmission. All this was radical stuff for the early thirties and would have been a major endeavor even for Ford or General Motors. For Citroën, it bordered on foolhardiness. Although the company had become the world’s fourth-largest automaker, the Depression and Citroën’s lavish spending had taken their toll on the company’s finances. For all his fascination with production efficiency, Citroën had never been particularly inclined to parsimony, whether in business or private life (a major contrast between him and Ford); being broke had seldom deterred him from placing a bet or spending lavishly. This was not an attitude that reassured his creditors, who were growing ever more numerous and more nervous. Citroën, however, was still chasing the one big win that would let him pay off all markers. The Citroën Traction Avant’s body is a monocoque shell, but the engine, transmission, and front suspension are carried on a bolt-on subframe. In theory, the entire assembly could be unbolted and wheeled away like a wheelbarrow for repairs and maintenance, although it wasn’t that easy in practice. Thirty years later, General Motors would use a similar approach for the Oldsmobile Toronado and Chevrolet Camaro/Pontiac Firebird.) This 1939 Citroën Light 15, like all post-1936 Tractions and most modern cars, has rack-and-pinion steering, a novelty at the time. The steering is very quick (only two turns lock-to-lock), but quite heavy. The official story is that the car we now call the Traction Avant was conceived solely by André Citroën and then developed by former Renault engineers André Lefèbvre and Maurice Sainturat over a period of only 18 months. That may have been true so far as it went, but the design was certainly not created in a vacuum. Back in December 1931, Citroën had visited the Philadelphia headquarters of the Budd Company, which manufactured the dies for Citroën bodies. While at Budd, he saw a prototype created by Budd’s brilliant engineers Joseph Ledwinka and William Muller of a front-wheel-drive (FWD) car with an all-steel, integrated body and an aluminum V8 engine. Citroën had previously expressed curiosity about unitized construction and FWD, so while his new car was not directly based on the Ledwinka/Muller design, it seems likely that it was at least partly inspired by it. Despite that precedent and Lefèbvre’s previous experience at Voisin, for whom he had developed an abortive FWD prototype, Lefèbvre and Sainturat had their work cut out for them translating these advanced concepts for mass production, particularly on the timetable Citroën demanded. Considering those pressures, the results were a remarkable achievement. In dimensions and mechanical specifications, the new Citroën more resembled a car of the seventies than anything of its own era. Designed by Flaminio Bertini and bearing a striking resemblance to the 1934 Ford, the ‘Traction’ was and remains a low-slung and rakish-looking car, as much as a foot (30 cm) lower than its contemporaries. With unitized construction, it was far roomier than its outside dimensions suggested. Its low center of gravity, independent front suspension (still far from universal at the time), and torsion bar springs (longitudinal in front, transverse in the rear) also provided a smooth ride and agile handling. The main practical drawback was a largish turning circle, a problem compounded by the tendency of the front halfshafts’ Hookes universal joints to bind in tight turns. Although the car had many advances, Citroën was forced to abandon at least one intended feature: the planned automatic transmission. Designed by Dimitri Sensaud de Levaud, the automatic was what we would now call a continuously variable transmission. It was very sophisticated, but it was easily overheated and unacceptably fragile. After the prototype broke down embarrassingly in front of a group of potential investors, Lefèbvre hastily devised a conventional three-speed manual transmission to replace it. The engine was perhaps the car’s least-novel element: a 1,302 cc (80 cu. in.) OHV four making a modest 32 hp (24 kW). This was carried on “Floating Power” engine mounts, also found on contemporary Plymouth cars and used under license from Chrysler. The 1,302 cc engine met Citroën’s original goal of a 62.5 mph (100 km/h) top speed, but only just — the practical limit was perhaps 60 mph (97 km/h) and reaching that speed took patience. Admittedly, there were still few roads in the world that allowed sustained speeds over 50 mph (81 km/h), but many of the Citroën’s competitors could outrun it, at least in a straight line. On the other hand, the Citroën was far more nimble, not a word easily applied to most cars of the thirties. The initial version of the new car, which debuted publicly at the 1934 Paris Salon, was called the Citroën 7 (“Sept“) in France, based on its 7CV fiscal horsepower rating. 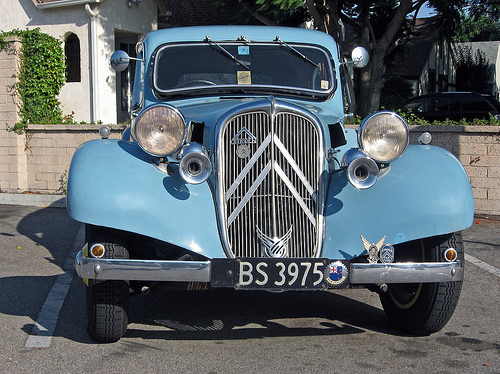 Since Citroën had previously offered 7CV cars, the company appended “Traction” or “Traction Avant” (Front Drive) to distinguish the new 7 from previous Propulsion Arrière (rear drive) Citroëns. Although “Traction Avant” was never the model’s formal name, it quickly stuck and all models were popularly known simply as “Tractions.” British cars were called Twelve or Light Twelve, reflecting the engine’s RAC taxable horsepower rating. France, like many European countries, used to class and tax automobiles based on their fiscal (or taxable) horsepower rating. Taxable horsepower is usually calculated based on engine displacement rather than actual, developed horsepower. In France, the formula for calculating fiscal horsepower — commonly known as cheval vapeur (“steam horsepower”), abbreviated “CV” — was the engine’s displacement in liters multiplied by 5.714, rounded to the nearest integer. For example, the Traction Avant 7B’s 1,529 cc (93 cu. in.) engine had a 9CV rating (1.529 x 5.714 = 8.74, rounded up to 9). Great Britain and some U.S. states used the Royal Automobile Club (RAC) formula for taxable horsepower, which was the square of the cylinder bore in inches times the number of cylinders, divided by 2.5. For example, a six-cylinder engine with a cylinder bore of 3.5 inches (89 mm) would have a taxable horsepower rating of 29.4 regardless of stroke length. Automakers often used a car’s taxable horsepower rating as its model name. 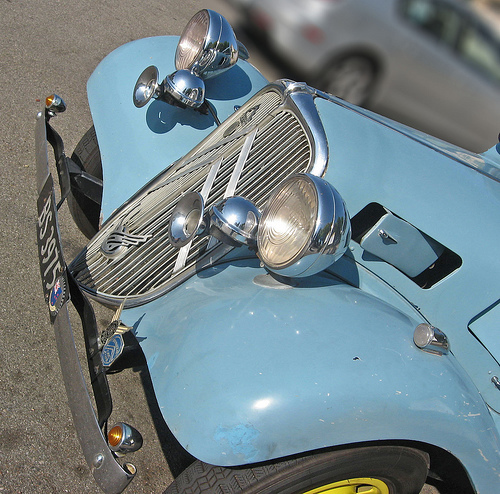 For instance, the immortal Citroën 2CV (“Deux Chevaux”) originally had a 375 cc (23 cu. in.) engine whose taxable horsepower rating was 2.14, rounded down to 2CV. Manufacturers didn’t always change these names when the engine displacement changed, however; when Citroën enlarged the 2CV’s engine to 602 cc (37 cu. in. ), its taxable horsepower rating actually rose to 3CV, but the company wasn’t about to rename such a popular car! The differing rating systems sometimes led to identical cars with different taxable horsepower ratings in different countries. For example, Citroën Tractions with the 1,911 cc (117 c. in.) engine were called Eleven (“Onze“) in France, signifying 11CV, but “Fifteen” in the U.K., signifying a 15 HP RAC rating. Today, most European countries base vehicle taxes on some combination of engine displacement, actual output, CO2 output, and emissions class, so the old taxable horsepower systems are essentially obsolete. Citroën intended to produce a lot of these cars, so the company tooled up to build the Traction Avant not only at a new factory in Paris, but also at plants in Belgium and Great Britain. British cars, constructed at the Citroën works in Slough, had right-hand drive, many British components, and various minor changes to suit the tastes of the British market. Early Tractions offered a choice of three body styles: a four-door Berline (called “saloon” in the U.K.), a two-door Cabriolet (roadster), and a two-door coupe called Faux Cabriolet (“fixed-head coupe” in the U.K.). None was cheap, starting at around 17,000 francs in the home market (something like $1,000 depending on the exchange rate and 2,000 FF more than planned), but they were roomy, practical, economical, and surprisingly entertaining to drive. The chrome slashes across the Traction Avant’s grille are the Citroën emblem, which officially is modeled on the herringbone double-helical gears that launched André Citroën’s business career. (Since Citroën was a Freemason, some observers have speculated that it’s actually a Masonic symbol.) 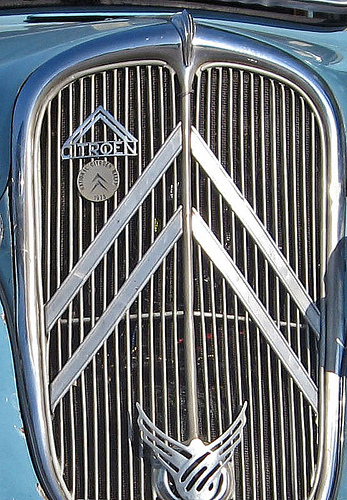 The emblem at the base of the grille, which covers the front of the transmission, is a stylized phoenix — an appropriate symbol given Citroën’s hopes that this model would revive his flagging fortunes. 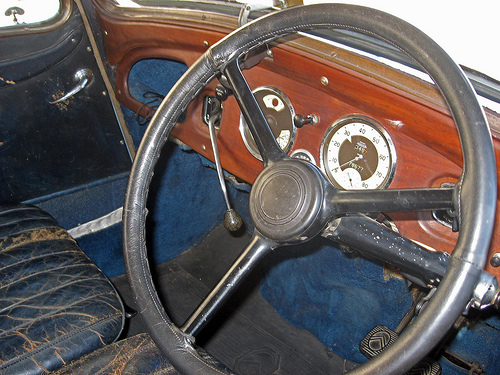 The British version of the 11CV, the Citroën Light 15, came standard with a wood dashboard and leather upholstery, adding a luxurious touch — appropriate, since the Traction definitely wasn’t cheap. Naturally, all U.K.-market cars had right-hand drive. Note the curious shifter, the Citroën chevrons on the pedals, and the highly optimistic 80-mph speedometer. Unsurprisingly, the Traction was enormously expensive to develop and launch, particularly with the added expense of new factory construction and the patent license fees for features like the engine mounts and front springs. Citroën still hoped that the new model would sell well enough to pull him out of the red, but he was now more than 150 million francs (more than $7 million) in debt, a staggering amount of money for the time. On December 21, 1934, he was forced to declare bankruptcy and step down. The creditor to which Citroën owed the most money was the family-owned Michelin tire company, which had also borne the brunt of Citroën’s creative payment tactics. In early 1935, Edouard Michelin took over the management of the company, a role he soon delegated to Pierre Boulanger. André Citroën, whose health had been worn down by the stresses of recent years, died on July 3 at the age of 57. Citroën’s exit and untimely death did not mean the end of either the Traction Avant or of the company. While one might have expected the Michelin family to cut their losses and either liquidate the company or demand a more conservative course, a determination to recoup their substantial investment inspired Michelin — and consequently Boulanger — to a degree of boldness rivaling even that of Citroën himself. A few of André Citroën’s more ambitious ideas were axed, including a planned 22CV version of the Traction powered by a 3,822 cc (233 cu. in.) V8, but his plans to develop and refine the Traction continued apace. This Citroën Light 15 (“Onze Légère” in France) Traction Avant is 168 inches (4,267 mm) long, a little shorter than a modern compact, but it rides a vast 114.5-inch (2,908mm) wheelbase. The wheelbase of the Normale is even longer, at 121.5 inches (3,086 mm), and the wheelbases of the Familiale and Commerciale are a whopping 129 inches (3,277 mm), comparable to a mid-sixties Cadillac. The principal reason for the long wheelbase is that the transmission and differential sit in front of the longitudinally mounted engine, much like front-drive Cords of the same era. Most modern FWD compacts have their engines mounted transversely with the transaxle next to the engine rather than ahead of or behind it, allowing the nose to be shorter at the expense of a wider engine bay. Like the later Volkswagen Beetle or Porsche 356, the Traction Avant evolved through a series of running changes. Early Berlines and Faux Cabriolets had a moleskin faux-leather roof insert, which eventually was replaced by a full steel roof. Outside access to the trunk was added in 1935 and new long-wheelbase models (the big Normale and even bigger nine-passenger Familiale) joined the original Légère models. The early car’s friction shock absorbers were replaced with more effective hydraulic shocks while rack-and-pinion steering was added in mid-1936, further sharpening the already excellent handling. From mid-1934, the smaller engines were supplemented by a bigger 1,911 cc (117 cu. in.) four with 46 hp (34 kW). Cars with the bigger engine were initially called 7 Sport, soon renamed 11 (“Onze“) to more accurately reflect the 11CV taxable horsepower rating. (British cars were called Light Fifteen.) A long-nose six-cylinder model, called 15-Six in France and Six Cylinder in the U.K., followed in 1938, offering 77 hp (57 kW) from its 2,867 cc (175 cu. in.) six. The 15 was capable of 83 mph (130 km/h), very respectable performance for the late thirties, but the considerable extra weight on the nose made the already-heavy steering even more difficult. The Onze was the best compromise and remained the most popular choice through most of the Traction’s existence. Production was interrupted by the outbreak of war and the German occupation, although Citroën engineers continued to work secretly on new model ideas. Before the war, Tractions had been popular with both police and those who sought to evade the police; the cars’ eventful careers continued throughout the Occupation as Tractions were commandeered by both the Nazis and the Resistance. Between those adventures, the travails of war, and the problem of rust, the survival rate of prewar cars is rather low. The Citroën Light 15 Traction Avant, known as “Onze Légère” in France, is powered by a 1,911 cc (117 cu. in.) overhead valve four, initially rated at 46 horsepower (34 kW) and later raised to 56 hp (41 kW) following the 1939 adoption of dual carburetors. That was enough to push this 2,350 lb (1,065 kg) car to a top speed of perhaps 70 mph (113 km/h); reaching 62 mph (100 km/h) took around half a minute. Citroën tried to develop a 22CV V8 engine by joining two “Onze” fours with a common crankcase, but it never got past the prototype stage. The 1.9-liter engine would prove to be long-lived; a much-refined version powered the Traction’s successor, the DS, into the sixties. Peacetime production resumed in late 1946, albeit with a much-curtailed range of models and colors. The Traction Avant continued to evolve well into the 1950s, gaining hydropneumatic rear suspension (a simpler forerunner of the system later offered on the DS, offered only on six-cylinder cars) in 1954. Production continued until July 1957, eventually totaling 758,857 units — impressive for a very unusual and fairly expensive car. 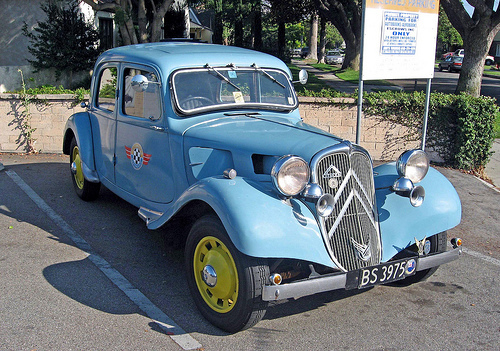 Citroën’s subsequent cars were no less daring or innovative than the Traction Avant. The 2CV, launched in 1948, was a deceptively simple, cunningly engineered people’s car whose rustic looks belied the sophistication of its basic design. The DS, introduced in 1955, was a technological tour de force that still looks futuristic today, as does the later SM coupe. The long-lived and popular GS, introduced in 1970, was less ground-breaking but no less individual, although the rotary engined GS Birotor version, a product of a joint venture between Citroën and NSU called Comotor, was an expensive failure. Sadly, the mounting cost of those ventures, combined with the first oil crisis and Citroën’s ignominious withdrawal from the North American markets, eventually pushed the company back into receivership in 1974. The French government called for a merger of Citroën and Peugeot, creating a new entity, PSA Peugeot Citroën, completed by the summer of 1976. Unlike Michelin, which had supported the company’s engineering and styling innovations, Peugeot put the brakes on Citroën’s wilder ambitions, pushing for the development of cheaper, somewhat more mundane models. While it would be hard to apply the latter term to cars like the XM, which replaced the CX in 1989, over the next 20 years there would be a gradual shift from the radical to the merely quirky. To modern eyes, the attractive but archaic styling dates the Traction Avant, but it remains a car ahead of its time. It survived for 23 years, longer than even André Citroën may have hoped, and, as he anticipated, it took many years for other manufacturers to catch up. If the Traction’s specifications no longer seem unusual or particularly special, it should be remembered that unit-bodied FWD cars with rack-and-pinion steering did not become commonplace until almost 40 years after the Traction introduced those features. Ultimately, however, the achievement of the Traction Avant lay not so much in the novelty of its engineering — its ideas were undeniably advanced, but by no means unknown in the thirties — but in André Citroën’s willingness to charge ahead in ways that his more conservative or more sensible rivals didn’t dare. For example, even Chrysler engineering VP Fred Zeder, one of the architects of the Chrysler Airflow (another contender for most advanced car of the thirties) wanted nothing to do with front-wheel drive. The eternal problem for both gamblers and innovators (and Citroën was surely both) is that the difference between daring prescience and foolish luck is often apparent only postmortem. Considering that, it’s hardly surprising that the large majority of automakers favor cautious incrementalism over bold leaps; the financial consequences of jumping too far in the wrong direction are often harrowing and history is littered with reminders that “novel” is not always “better.” Still, it would be a poorer and duller world without at least a few brave or foolish souls willing to not only imagine what could be, but also lay their money on the line to try to prove it. Our sources included Arch Brown, Richard Langworth, and the Auto Editors of Consumer Guide, Great Cars of the 20th Century (Lincolnwood, IL: Publications International, Ltd., 1998); Wiljan Cats’ Citroën page, Cats-Citroën, www.cats-citroen. net, accessed 30 July 2008; Mike Covello, ed., Standard Catalog of Imported Cars 1946-2002, Second Edition (Iola, WI: Krause Publications, 2001); Niels Heilberg, “Citroën Faces,” n.d., www.geocities. com/ MadisonAvenue/4430/bluebook.html, accessed 1 August 2008; Julian Marsh’s splendid Citroën website, Citroënët, www.citroenet.org.uk, accessed 30 July 2008; Michael Lamm, “Model A: The Birth of Ford’s Interim Car,” Special Interest Autos #18 (August-October 1973), reprinted in The Hemmings Book of Prewar Fords: driveReports from Special Interest Autos magazine, eds. Terry Ehrich and Richard Lentinello (Bennington, VT: Hemmings Motor News, 2001), pp. 12-21, and “Two Look-Alikes: Ford & Citroen” in Special Interest Autos #9 (January-March 1972), reprinted in ibid, pp. 44-51; David Owen, “Gear Maker, Arms Maker, Car Maker: The Legacy of André Citroën,” Automobile Quarterly Vol. 13, No. 2 (Spring 1975); Jon Pressnell, “Citroën Traction Avant,” Classic & Sports Car May 1999, pp. 104-109; William K. Toboldt and Larry Johnson, Goodheart-Willcox Automotive Encyclopedia (South Holland, IL: The Goodheart-Willcox Company, Inc., 1975), and the Wikipedia® entry on tax horsepower (en.wikipedia.org/wiki/Tax_horsepower, accessed 1 August 2008). Chrysler engineer Fred Zeder’s remarks about front-wheel drive were described by former Chrysler designer Ed Sheard in Michael Lamm, “1931 Chrysler 6,” Special Interest Autos #40 (May-July 1977), reprinted in The Hemmings Book of Pre-War Chryslers: driveReports from Special Interest Autos magazine, ed. Richard A. Lentinello (Bennington, VT: Hemmings Motor News, 2002), pp. 20-25. Historical exchange rate data for the dollar and British pound were estimated based on data from Lawrence H. Officer, “Exchange Rates Between the United States Dollar and Forty-one Currencies” (2009, MeasuringWorth, https://www.measuringworth.org/exchangeglobal/; used by permission). Please note that all exchange rate values cited in the text are approximate and are cited for informational and illustration purposes only; this is an automotive history, not a treatise on currency trading or the value of money, and nothing in this article should be taken as financial advice of any kind! A pal of mine restored a 50 model. He drove us about 60 mi round trip one night. This little car was never meant to be driven at American highway speeds and the noise level was incredible. The gearshift sticking straight out of the dash looked menacing. An interesting car but not really meant for American driving. Definitely not, although in fairness, at the time the Traction was designed, I don’t think there were many places in France or England where you could sustain speeds much above 50 mph for long, rendering its high-speed capabilities a bit moot for many owners! Very good article but Mr. Citroen could not have toured Ford’s Rouge factory in 1912 as construction of that plant did not start until 1917. Ahah, thank you for catching that! You’re absolutely right, and I’ve amended the text. This error actually appears in several published sources, including André Citroën’s entry on the European Automotive Hall of Fame website. Citroën DID visit Henry Ford in Michigan in 1912 and again in 1923, but the 1912 visit was to the Model T Automobile Plant in Highland Park, not the Rouge — as you point out, construction on the Rouge didn’t begin until 1917, and it wasn’t finished until 1928. These are great cars that needed to be highlighted. Ford was hostile to Jewish financiers and those he viewed as subversives, not to Jews in general. As Citroen was an engineer and fellow manufacturer the basis for Ford’s hostility did not apply to him. Citroen’s family were Dutch who came to France. Citroen is Dutch for citrus fruit, that is, lemon, as his grandfather had been a seller of lemons in the Netherlands. Andrew Citroen had been with the Mors automobile maker as chairman from 1908, having restored Mors to profitability. He streamlined French artillery shell production in WWI, then went into the herringbone gear business and then introduced the Citroen automobile in 1919. In 1925 he bought the Mors company and began production of Citroens in the (then-former) Mors factory. He also went to a steel body made under American Budd patents, thereby making one of the first “safety” cars. Very good article! Not easy to summarize the Traction’s rocky history in a few words. The takeover by Michelin saved the company and the car, as the austere tyre-maker instilled some sanity in Citroën’s mad gamble. 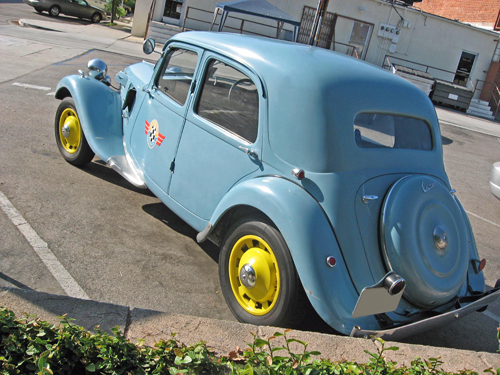 First, Michelin reintroduced the ’33 RWD 4-cyl. range (to attract conservative customers), the 7UA and 11UA. Then, Michelin stripped the Traction as much as it could to lower costs. Finally, they cancelled a number of models, such as the SWB and LWB 11CV “coupe de ville” (with a divider window) and the V8 range. The great Traction myth, the 22CV V8 models, were shown at the Paris motor show in October 1934 (and at the Brussels show in December). 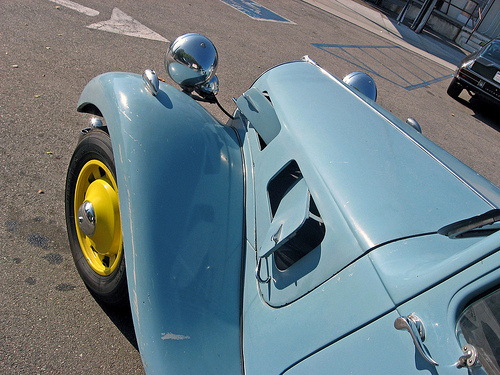 They sported distinctive headlights flared in to the fenders, and a specific grille. Despite decades of rumours and investigations, not a single one has been seen since then (at least five were photographed at the time). – the 2CV’s original engine was 375cc in 1949. The 425cc version came a few years later. Thanks for the corrections — I’m embarrassed that I didn’t catch the 2CV error sooner! The Traction is certainly lower than the ’34 Ford, although given the vast number of American hot rods based on the 1932–34 Fords, that alone doesn’t really diminish the resemblance. (Also, even on factory-built Fords of this era, standard-trim cars didn’t really have much brightwork. This was still the era when American buyers paid extra for their shiny trim.) I don’t think the Citroën is a straight copy of the Ford by any means, but to American eyes there is a strong resemblance. I’ve heard that the 22CV didn’t see the light of day because the chassis simply couldn’t handle the power, from the standpoints of both handling and body strength. The Traction Avant wasn’t very rigid structurally. This was especially true of the cabriolets, for obvious reasons, and they were offered only with the less powerful engines for that reason. At some point CAR magazine reported that the body of a Citroen CX prototype had broken in two. A Traction Avant prototype had done the same, so it was a case of history repeating. The dilemma with unitized construction in the age before computer modeling is that it was really challenging to estimate the structural loads and how strong each area of the structure needed to be. That’s why most of the early American unit-bodied cars, like the Step Down Hudsons and the ’58 Lincoln, were so ridiculously overbuilt. Even when there started to be computer programs for estimating loads (beginning around 1960), validating those figures took lots of trial and error, which was expensive. I daresay a lot of prototypes broke during testing, which was their purpose — beat the stuffing out of them to see what you need to reinforce. My love affair with the Citroen Traction started when I bought a 1949 small boot Light 15, second hand for $50. I was 17 years old. I worked on it a bit myself and had Maxim Motors ( Brisbane) back cut the gears to stop it jumping out of 2nd gear. It was a real “head turner” in my youth. Half way through college though, it developed “blow by” and I didn’t have the cash for an engine rebuild so I sold it for $150. A decision I regretted for over 40 years. As I approached retirement, I decided I would buy one as a gift to myself. A week later I found one in Perth Western Australia. The love affair was rekindled. I now have four Tractions The light 15, two Big 15’s and a Familiale. They are still “Head Turners”. Everyone who sees them remarks on the style. The engineering story create even greater interest. The Tractions were so far ahead of their time! Beautifully written article; many thanks. Am trying to buy my first Light 15 after wanting one forever. Drove one today for the first time, here in Johannesburg, South Africa. It had an amazingly similar feel to my 1931 Model A Ford although the brakes and steering and general road behavior are chalk and cheese. I love that Andre was inspired by Henry. Perhaps the similarity in feel between the A and the 15 has a spiritual element to it. I feel that the 1933-34 Ford was more influenced by the styling of my great uncle’s 1932 Graham Blue Streak than by the Citroen Traction – Avant. Perhaps so — the resemblance of the grille and headlight treatment is pretty strong, much more so than to the Traction. Judging by the cockpit photo, the car has suspended pedals, which I wouldn’t have expected on a car of this vintage. Was this another Citroen first? Y’know, I honestly don’t know. I tried doing a patent search, which was unrevealing, and even if Citroën claimed it was, the innumerable lexicon of now-obscure prewar would make it difficult to verify.